It is during the early 12th Dynasty that two of the greatest texts of Egyptian literature were composed. 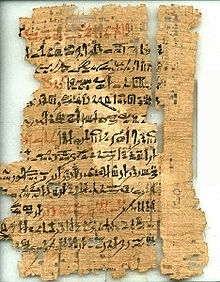 In The Instructions of Amenemhet' (known from seven papyri copies of later date), the ghost of Amenemhet reveals himself in a dream to his son and successor Senusret I, giving him good advice and warning him not to be too intimate with his people. The ghost describes how, as the old king, he was attacked and murdered by his guard while resting on his bed after supper. The other composition, The Story of Sinuhe’, is known from many Middle and New Kingdom hieratic papyri and on limestone ostraka (the largest, in Oxford, is boulder-size). It was evidently used as a set text in the ancient Egyptian classroom. Although obviously fictitious, the political part of the story is grounded in fact, and the sociological aspects give an excellent picture of the life and aspirations of an emigre Egyptian. Sinuhe, a young man brought up in the palace, overhears conspirators plotting to kill the king and, fearing that he might be implicated flees into the desert, making his way to Palestine and Syria. (Interestingly, he mentions by name some of the forts he slips past, thereby indicating Egypt’s military awareness of her eastern neighbours.) Sinuhe is well received by the Palestinian Prince of Retjenu, he marries well, has children and grows old, but he fears to die outside Egypt. The story ends happily when he is recalled to Egypt by Senusret I, granted honours and a tomb.